Welcome to the Théâtre Illuminata, where the characters of every play ever written can be found behind the curtain. The actors are bound to the Théâtre by The Book, an ancient and magical tome of scripts. Bertie is not one of the actors, but they are her family. And she is about to lose them all because The Book has been threatened, and along with it the Théâtre. It’s the only home Bertie has ever known, and she has to find a way to save it. But first, there’s the small problem of two handsome men, both vying for her attention. The course of true love never did run smooth. . .
Let me start this review off by saying that I am a huge theater nerd, and an actress (I’m playing my first lead this December! ), so I was really excited to read Eyes Like Stars when I heard it was all about plays and took place in a magical theater. Yes. Eyes Like Stars also got me good because Hamlet is my favorite play ever, and Ophelia is my favorite character. I did a mini-squee each time Ophelia was mentioned. And, to make the impact even greater, one of the main characters is from The Little Mermaid, which is my favorite Disney movie. So, needless to say, I loved the book before I even started reading it. But, whoo, when I read it, it was like an explosion of amazing. Kablooie. The whole idea of it was pure genius. Every character from every play that was ever written- -most prominently Shakespeare’s plays- - live in the Theatre. So of course, we have quite the quirky cast. Bertie was my favorite character; she was strong and just all-around loveable. She tried to do her best by the Theatre, and cared for the people that lived there. But more importantly, she was just trying to find out who she was. Some of the curves that Mantchev threw at us sort of left me…confused. I would have to re-read it a few times, and then I kinda understood what was going on. Also, I couldn’t pin point a setting for the book. Is it written in our world, or in a made up fantasy land? Is it modern day? (I think I recall the mention of a soda-can, but then other things just don’t make sense if it was modern day.) Or is it a more Victorian Era-inspired time? That was the only problem I had; otherwise, the book was perfect! 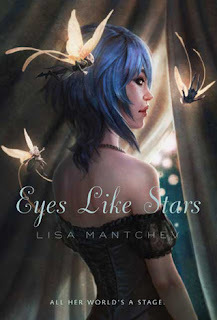 Definite must read for YA fantasy fans! I give this book a solid 5 out of 5 stars. That is fab that you rated this books so high. I recently bought this one on my Nook. Stop by for a cuppa tea sometime. Great review! I've been thinking about picking this one up for a while now because the cover is gorgeous and the premise sounds interesting. It's wonderful to hear that it's got an arsenal or unique and interesting characters. I'll probably get a copy soon. This does sound great. I hadn't heard of it before. Well done for getting a lead role. Which play are you doing?